What should I look for when buying a palm? A palm tree appeals to the imagination of many. Moreover, they are more and more often offered for sale. It is therefore not surprising that more and more people are buying a palm. But what should you pay attention to when you buy a palm? In this article we will give you tips! As is often the case, when buying a palm the first impression is important. Not only should the palm itself look beautiful and healthy, also the environment and the seller can often tell you more about the possible condition of the plant. Preferably there are several specimens so you can compare and select the most beautiful ones. After the “love on first sight”, it is time for reflection. Can you really offer the right conditions? For instance, some tropical palms require very high humidity, something that is difficult to achieve indoors. Be honestly realistic with yourself to avoid disappointment. 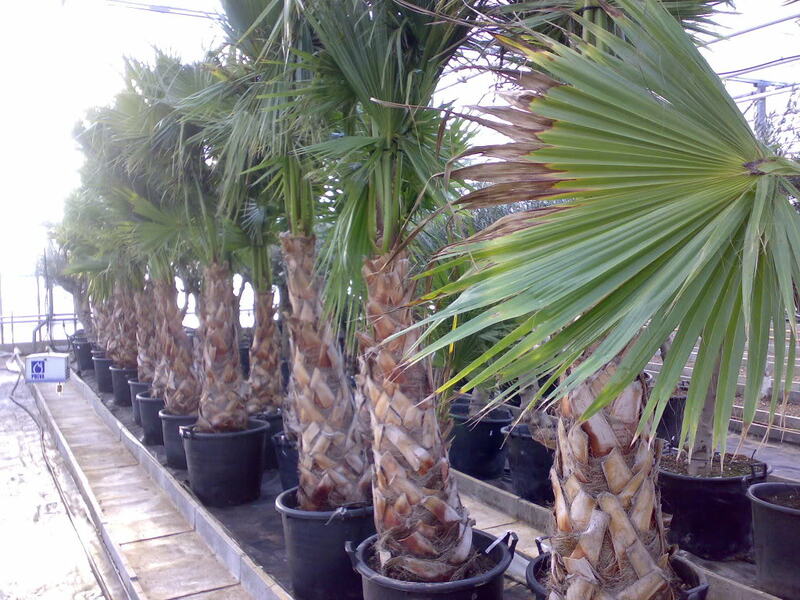 Sometimes a relatively low price can make it worth a try and consider the palm as an annual. The coconut palm (Cocos nucifera) is here a good example as it probably won’t last that long but it only costs a few quid. As mentioned above, price also plays an important role in considering a purchase. Remember that the price of specialized nurseries is often the best. An additional advantage is that you will also have the right advice. But also many hobbyists regularly sell their surpluses. For instance, inform yourself on dedicated forums. Does the palm have beautiful green and shiny leaves? Yellow leaves can indicate malnutrition. Brown leaves indicate damage due to inappropriate care. Are the leaf segments of the oldest leaves well deployed? Folded leaf segments indicate a problem with water absorption. Are the leaves not contaminated with spider mite, scale insects, greenflies or mealybug? These pests are mainly located on the underside of the leaf. Honeydew often betrays the presence of lice. Do you see any new emerging leaves? This is a good thing because some palms grow very slowly. Does the stem look good, without damage or holes? Holes may indicate traces of insect larvae. Very harmful to the palm but also very contagious for other palms. Does the palm have a well rooted root ball? Lift the palm out of its pot to check this. 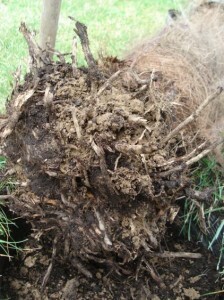 Healthy roots are white-yellow colored. When it is practically impossible to lift the palm out of its pot, you could push the trunk. Is the palm sturdy in its pot or rather loosely? In this last case, the palm has not yet created enough roots since it was dug out at the nursery. Bigger dug out palms are often held in place by some wooden strips fixed on top in the container. Such palms may have more trouble to settle. 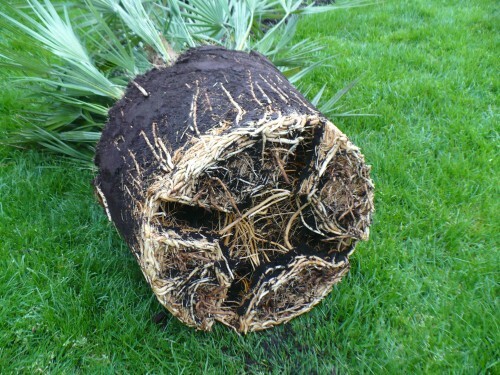 Is the palm planted in good quality potting soil? Also look several cm’s/inches under the surface! 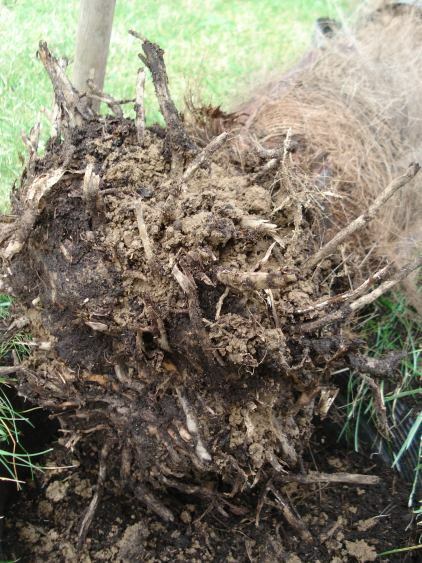 Some nurseries cover thick clay with a layer of good quality soil. If you always carefully check the above, you are already well started to enjoy a beautiful palm for a long time!